*.csv file is not provided. (as a result of the program may save in files up to 200 IP addresses, depending on the number of addresses in each range). Generating step is limited by two steps. Zh Tools IPv4 Generator Demo ipgentooldemo.zip ( 207 Kb ) including documentation (MHT format-Web Archive). It’s possible to accept the payment with using the on-line system WebMoney. Check the possibility to make the payment in your location through WebMoneyGeo service. Technical support is provided at the specified email address. Extracting IP Address ranges from *.txt , *.csv, *.db files . 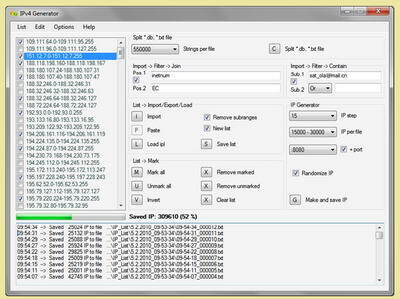 Extracting IP Address ranges using custom filters and search operators. Custom filters (Join/ Contain) allow you the flexibility to search for IP Address ranges using search operators (And/Or). extract ranges possible for countries, cities, service providers, email, etc. or any other substrings. Cutting of large source files into parts with the number of lines in each of the 100 to 950 000 in increments of choice 50000. Removing duplicated IP ranges and filter out all subranges. Saving/loading list of IP addresses to/from a *.ipl file. of the files with lists of addresses for a given step of the generation. and the total number of 1 to 4'294'967'296 (range 0.0.0.0-255.255.255.255). Saving lists of generated IP addresses like the text files with a customizable number of rows and sort order. Displaying the general information in the log window. Changing the language interface, all messages in the information line and the field log. Starting and work on removable media. free space on your hard drive and the amount of free memory in the system. Pv4 Generator already comes in executable form, there is no installer so you can just unpack the zip and run the ip_gen.exe file. It does not make any entry to your registry, does not contain any adware/spyware modules. Installed MICROSOFT VISUAL C++ 2008 RUNTIME LIBRARIES.